These Salted “Caramel” Popcorn Squares are a must for any popcorn and salted caramel aficionado. 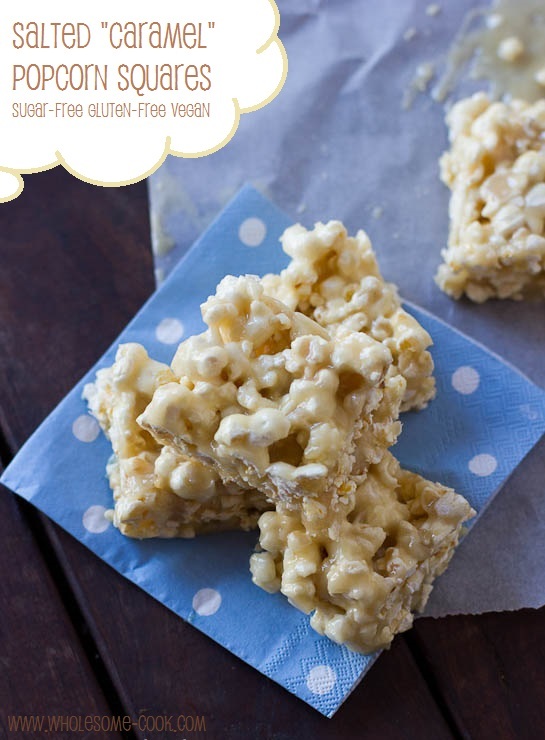 Quick to make and processed sugar-free (fructose-free) plus unlike microwave popcorn, corn popped this way is fat-free and does not contain toxic chemicals. Fact: we love popcorn! Fact: Microwave popcorn can contain almost 50 different chemicals like artificial flavourings, ink and glue (read more here)! Yuck. But when prepared right, popcorn makes for a nutritious, fibre-rich snack option that’s much better for you than potato chips, savoury biscuits – especially those additive-laden flavoured varieties, or pretzels. And this is where the Kambrook Little Chefs Popcorn Maker comes in. 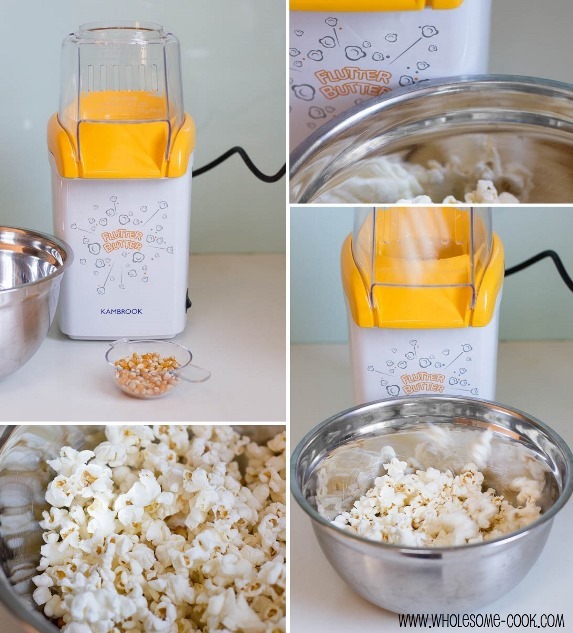 The Butter Flutter popcorn maker is easy to operate – even for kids though parental supervision is advised for younger kids as the inner bowl can get hot. It pops corn to perfection with no need for fat and little waste or burnt kernels. And it’s a breeze to clean too – just give it a wipe once it’s cool. For your chance to win one, see the giveaway section below! It comes with a recipe booklet, but since most of the sweet suggestions contain plenty of sugar, I have decided to make my own sugar-free popcorn snack. Inspired by every kid’s favourite the Rice Krispies and adapted from Dreena Burton’s Nicer Rice Krispies recipe (included along 36+ other sugar-free treats in Guilt-Free Desserts). Trust me, these Salted “Caramel” Popcorn Squares have a great chance of becoming your family’s new lunchbox or snack-time favourite. These Salted "Caramel" Popcorn Squares are a great sugar-free treat for kids and grown ups alike. Perfect as an afternoon tea or lunch box treat. Sugar-free, gluten-free, dairy-free, vegan. Inspired by a this recipe. Makes 8 squares. Line a loaf tin with some waxed baking paper. Place macadamia nut butter, rice malt syrup, vanilla extract and sea salt in a large saucepan over low heat. Cook, stirring, until the mixture begins to "melt". Remove pan from heat and add popped corn. Mix well until popcorn is covered with the "caramel". Transfer the mixture into the paper-lined loaf tin and press down into the corners with a spoon. Place in the fridge for 15 minutes for the mixture to cool. When set, remove from the fridge and slice into squares or bars. Serve or store in an air-tight container in the fridge. How to Enter: 1) Leave a comment on this post, telling me what popcorn treat / flavour you would make first. 2) Register your entry via Rafflecopter below. Bonus Entries: You can earn bonus points for 1) subscribing via email or being an existing subscriber; 2) plus earn daily entries by sharing this post on social media. Terms: The prize is 1 Kambrook Little Chefs Butter Flutter Popcorn Maker. Giveaway is open to readers with an Australian postal address. Entries close 11:59pm Sydney time on Sunday 19th May. The prize is provided courtesy of Kambrook and valued at A$34.95. Winner will be announced on this post and contacted via email on Monday 20th May. As far as I am concerned you cannot go past just plain popcorn – no flavouring at ALL. Absolutely love it. I suppose if you must, then some butter or salt is the way to go. hmmm would LOVE one of these popcorn makers. so going to go with some salty chili concoction as my first popcorn flavour. followed afterwards by your salted caramel squares. mmmm…popcorn! If I had a Kambrook Popcorn maker I would add a few nuts and toss the popcorn and nuts in melted dark chocolate. I used to love the dark chocolate Moose Munch from Harry & David, and with healthy popcorn from the Kambrook, it would be easy to make a “clean” version of my former favorite snack. Yum! I just Found a Recipe for Peanut Butter Popcorn that sounds Delicious! I’d make Chocolate Sheep! They’re just like making chocolate spiders except you use popcorn instead of fried noodles… Yum! actually love a combination of vanilla, sea salt, and cinnamon! with a dash of coconut oil! I would love to make caramel popcorn! I keep telling myself I need a new popcorn maker. This one looks like just what I need. Those caramel popcorn squares are calling me. Peppery sugary salty Kettle corn babbbyyyy! Then some chocolate dripped crushed cashew popcorn balls. I would go with the caramel flavour first. I have always loved caramel pop corn! I love caramel, I’d go with the caramel squares! Caramel Popcorn with crushed nuts and 100’s and 1000’s mixed through it! How fun!! I have an obsession with marshmallow popcorn. I would do that first. Peanut Butter and Marshmallow Popcorn slice – I once bought it at a fete and have never been able to successfully remake! im an ol fashion plain with salt person.. right now I make my popcorn on the stove in a pan with a little bit if coconut butter…. mmmm! Peanut Butter Popcorn! All of my families love peanut butter flavour. I would certainly make this recipe. Yum! I absolutely LOVE caramel popcorn, so a sugar-free version looks and sounds very appealing. i would make a caramel version with the inclusion of salted nuts (preference macadamia) with a hint of honey. There are so many awesome popcorn recipes I would have trouble just picking one but I do absolutely LOVE salted caramel popcorn so I would probably have to go with that one. Your sugar free version makes it a more often treat than just a special treat. i love making popcorn. it’s just a great snack for everyone’s lunchbox. 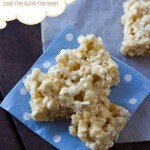 i think i would make your caramel popcorn squares first Martyna, they look delicious. in fact i’m planning to make some this weekend anyway. We are BIG fans of any type of popcorn in this house but my, otherwise rather fussy, daughter is a massive fan of popcorn with crumbled kale chips on top so I think I would make up a big batch of that first. Although I just made your above recipe and it is DELISH so it would be a hard decision as to which would be made first. Hi Alyssa, apologies for the late reply. Can he have sesame? You could try using tahini (raw sesame paste). Cinnamon and Salt popcorn is where it is at! Wow these look absolutely amazing!! 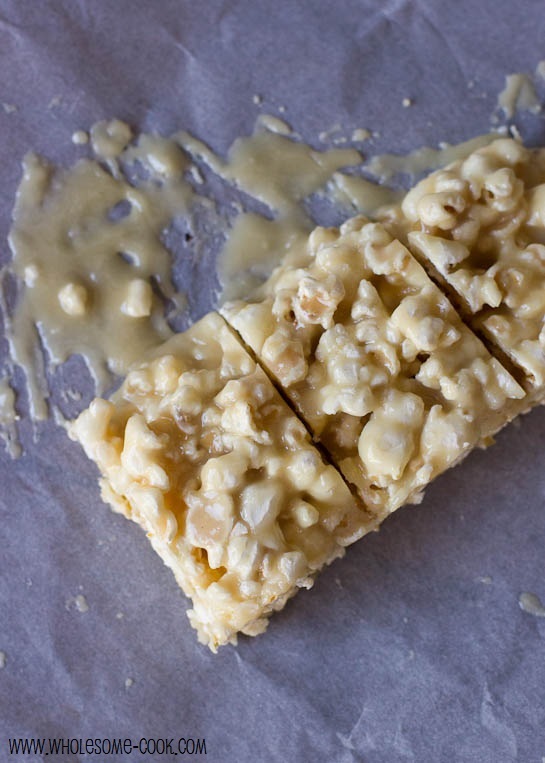 I love popcorn and I love rice krispie treats–this looks like a perfect meld of the two 🙂 I saw in the comments that you can substitute tahini for the macadamia nut butter which is perfect since I have tahini on hand, but do you think you can substitute honey or maple syrup for the rice malt syrup? Or brown rice syrup? Are there any other suggestions to macadamia nut butter as I cannot find it anywhere!! Wow! The “caramel” tastes delicious. I’ve been licking the bowl clean. The slice is in the fridge cooling, can’t wait to try the finished product. I made my own cashew nut butter with salted roasted cashews, cause that’s what I had in the cupboard. I had exactly 4 cups of home popped popcorn left over from my son’s party yesterday. Next I want to try it with peanut butter. Yum! Just made another batch of these, this time with freshly popped corn, 1/4 cup macadamia butter, 1/4 cup unsalted butter, 1/2 cup raw organic honey, vanilla and Murray River salt flakes. I think they’ll be a hit in the lunch boxes tomorrow, if I don’t eat them all tonight! I made the macadamia butter from freshly shelled macadamia nuts given to me by a friend with a macadamia tree. I’ve only managed to shell enough to make a small amount of butter so far. Need to find an easier way to crack these hard little nuts! Hi Anna, you are so blessed to have fresh macadamia nuts (and a good friend). Check out your local grocer or kitchenware store for special macadamia nut crackers, designed specifically to crack the hard shell. Your adaptation sounds scrumptious. 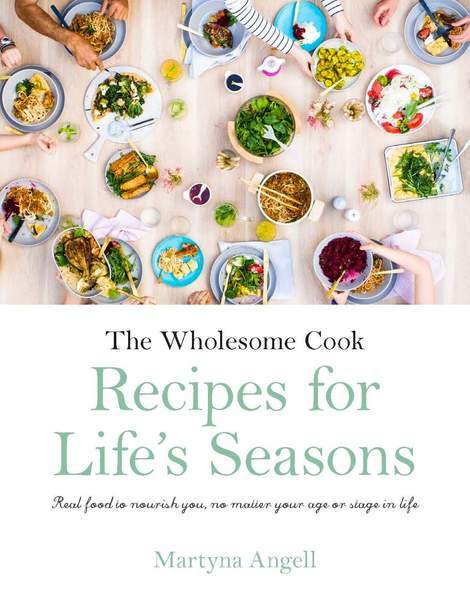 Feel free to post a pic on instagram tagging #wholesomecook so that I can share your creation.